Amazon is expanding its range of Echo smart home devices with the introduction of the Echo Show. The new Intel Atom x5-Z8350 processor powered device delivers the smart home functionality of previous Echo speaker devices, with Alexa and a built-in speaker, but its built-in screen adds a further dimension to its usefulness. "Echo Show brings you everything you love about Alexa, and now she can show you things," Amazon sums up on the product page. "Watch video flash briefings and YouTube, see music lyrics, security cameras, photos, weather forecasts, to-do and shopping lists, and more. All hands-free—just ask." The devices eight microphones, beam-forming technology, and noise cancellation means it should hear your commands from across the room even with background sounds and music playing. As with other Echo devices users summon Amazon's AI assistant with the wake word 'Alexa'. Equipped with a 7-inch touchscreen, the Echo Show can be used like a regular tablet but with so many natural voice commands you shouldn't have to touch the screen very much, if at all. That's good if you are looking for cooking instructions while you are busy and messy in the kitchen, for example. Continuing this example, after you put your baking master-work in the oven you can ask Alexa to initiate a countdown timer. The visual addition to smart-home functionality might be most compelling for some. Being able to see your front door or baby monitor camera (Ring and Arlo devices) on screen looks rather handy. Lighting and heating controls from WeMo, Philips Hue, ecobee, and others are compatible. Amazon touts the ability of the Echo Show to display on-screen lyrics from your Amazon Music collection. The Dolby stereo speakers can also be utilised with streaming services from Pandora, Spotify, TuneIn, iHeartRadio, and more. A new feature comes to all Echo devices with the launch of the Echo Show. Alexa calling can be undertaken between Echo devices of smart devices with the Alexa App. 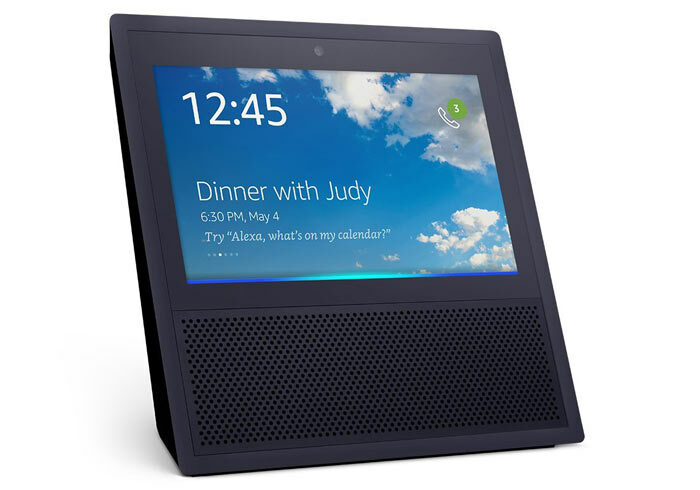 Of course the Echo Show supports video calling (5MP front camera), and just a quick voice command is required to call friends and family. We don't have any information about UK availability or pricing for the new Amazon Echo Show. US customers can pre-order it in black or white chassis versions for $229.99 for delivery after 28th June. If you buy two or more you can get $100 off your order. A couple of weeks ago Amazon announced the Echo Look, an Alexa powered 'style assistant'. seems completely unnecessary… just takes a few smartphone features and sticks them on to a device with less portability. The only way I see a device like this working is with a full household implementation.. a bit like how HAL9000 works from everywhere in the ship except that one pod.